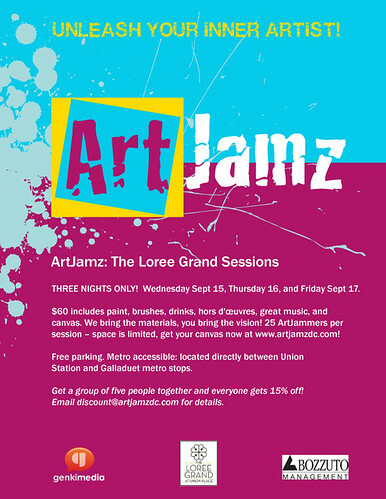 ArtJamz, the brain child of Genki Media’s Michael Clements, returns this week, September 15th, 16th, & 17th and invites you not just lightly tap, tap, tap into your possible inner Monet, Manet, Picasso or Koons, but rather to unleash your inner artist. That’s right, I said un.leash! In fact, I would not be surprised if during the session, Clements roared in “Clash of the Titans”-style: “UNLEASH THE ARTIST!” (“artist” replacing “Kraken” or “hounds” or “fury”…you get my drift).Ã‚Â Whatever you do, you are supposed to be unafraid, check your pride at the door and have F.U.N. For your mere $60 you get the following (and only 25 lucky peeps per session each night): access to paint brushes, acrylic paints and is given a blank canvas, which they get to paint and keep. ArtJammers have four hours to paint, while being entertained by an ArtJamz host, listening to music, drinking, eating, and getting a chance to mix and mingle with their fellow ArtJammers. Register now as there are hours left in the day and you don’t want to miss out. Please feel free to send photos of your own pieces of work, as we’d love to share them on the Punch.